Okay, I admit it; I am typically an impatient griller. Normally I let my husband man the grill when it comes to anything beyond burgers and dogs or I end up charcoaling the meat, not a good thing! However, all of that changed tonight! When deciding on what to have for dinner, I looked to the freezer to see what was on hand. What I found was a pack of skin-on chicken thighs and legs. That meant it was time for some crispy, juicy BBQ chicken. Because I allowed the meat to cook slowly, barbecue not grill, the result was a crisp skin, melted away fat layer, and extremely juicy meat. It was so good that after dinner I looked at my husband and said "I think this is the best barbecue chicken I have ever made!" You should really give this a try. 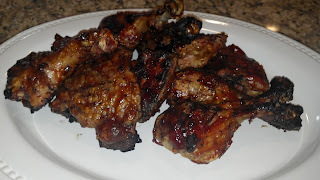 Even if you do not think you like dark meat, which I am not a big fan of, I really think that this will change your mind. 1. Preheat grill to medium low. 2. Pat the chicken pieces dry with a paper towel. 3. Drizzle with vegetable oil and gently rub with your hands to spread over the meat. Sprinkle both sides with salt. 4. Place meat on grill, skin side down for the thighs, and allow to cook undisturbed for approximately 5 minutes. This allows the skin to sear. Watch the grill closely to minimize flare-ups. You want the skin to sear, not burn! 5. Turn your grill down to low. If you have hot spots on you grill, avoid placing the chicken near those areas. Remember, you can control the intensity of the grill by also reducing the flow of gas to the grill. If your grill is still cooking too fast even on low, turn the gas nozzle down to reduce the amount of gas escaping the tank. 6. Flip the chicken over and allow to cook for 30 minutes. Check the grill periodically to make sure the meat is not burning. You might need to move the pieces around some due to hotter areas on the grill. 7. Turn the meat and allow to cook for an additional 30 minutes. 8. After the second 30 minutes, turn the meat back over and baste with your choice of barbecue sauce. I used a sweet, homemade sauce, but any sauce will work. Allow the meat to cook for about 5 minutes. 9. Turn the meat one more time and baste again. Cook for a final 5 minutes. 10. Remove from grill and cover with foil for 5 minutes before serving. Remember, every grill is different. You must learn your grill. If you are unsure if your meat is done, check with a thermometer. The meat should register 170 degrees. Keep a squirt bottle of water on hand in case of flare-ups. A quick squirt of water will solve the problem. As fall arrives and the air becomes cooler, it is once again time for the comfort foods of my childhood. 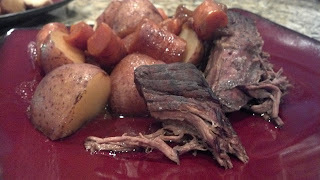 For tonight's Sunday dinner, it was time for the slow cooking of a tender pot roast filled with intense flavor and fresh roasted vegetables. This meal is great to entertain friends and family as well as sneak some sweet vegetables into your children, or husband! Since there are only 2 of us in the house, I did a small roast, with enough for leftovers. If you have a larger party, just increase the seasoning and liquid. This is a pretty fool proof meal. 1. Heat a Dutch Oven over medium high heat with just enough oil to lightly coat the bottom of the pan. 2. While the pan is heating, pat the London Broil with paper towels to remove moisture. Season with salt and pepper to taste. I do a a moderate coating. If you like a saltier taste, then add more; it is really up to you. 3. Once the oil is hot, place the roast into the pan and allow to sear for 4-5 minutes. DO NOT TOUCH!!! The meat needs to have time to form a solid crust. 4. Turn the meat over to the other side and allow another 4 minutes of searing. 5. Remove the meat from the pan. 6. Add the garlic and onions to the pan and allow to season the oil, approximately 1 minutes. Add 1/2 teaspoon salt and pepper. 7. Add the wine and Worcestershire to the pan and scrap the bottom to release and seared on flavoring. 8. Add the meat back to the pan. 9. Add just enough water to come 3/4 the way up the meat. 10. Add the roughly chopped carrots to the pot. You want large chunks because they have a long time to cook. 11. Place the lid on the pot and cook in a 325 degree oven for 2.5 hours. 12. After 2.5 hours, remove the pot from the oven (carefully), and add the potatoes. If the moisture level looks low, add additional water to come approximately halfway up the meat. 13. Cook for another hour. 14. Remove from the oven and allow to sit on the stove for 10 minutes. Note: If you use a large piece of meat, you may need to cook additional time. I have cooked large roasts for 4-4.5 hours. As long as their is moisture, the meat will continue to tenderize and not dry out.